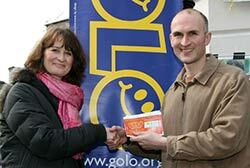 Launched in November 2008 GOLO not only provides the opportunity for good causes in the town to benefit but also for supporters of the lottery to win a top prize of £500 or sixteen other cash prizes every month. We have distributed over £40,000 to local good causes. GOLO is run entirely by unpaid volunteers, and apart from the costs of services and materials contracted through third parties, no fees for administration are deducted from the GOLO fund. Public draws are held at The Pepperpot in the High Street, Godalming on the last Saturday of every month. All winning numbers are published in the Godalming edition of The Surrey Advertiser, at GOLO outlets, and on the GOLO website every month. 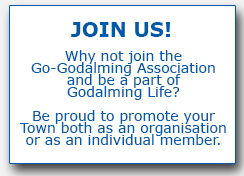 The GO-Godalming Association welcomes applications from local businesses to sponsor the monthly Godalming Lottery. The GOLO sponsorship scheme was established to enable organisations to contribute toward the running costs of the lottery and in return take benefit from the publicity generated by being associated with GOLO for the monthly draws. Your sponsorship in effect helps us give more to local causes. Visit the GOLO website for latest news about good causes and recent winning numbers.